Goatboy’s 40k Thoughts: FAQ IT (Again)! 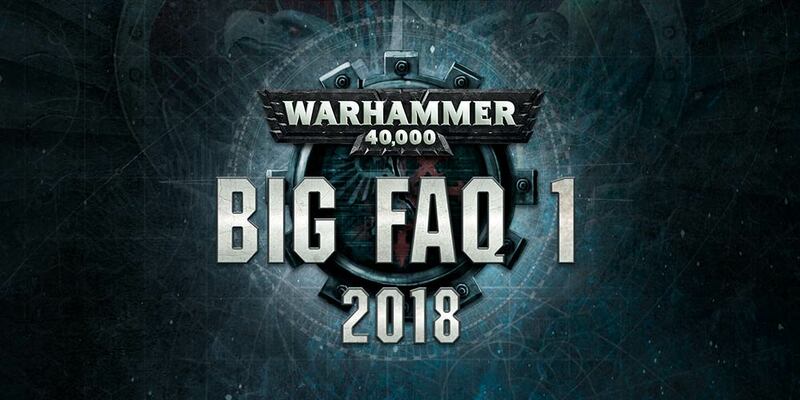 Today let’s talk about what we can expect from GW’s 40K BIG FAQ 2, which should be coming soon. Goatboy here again with a bit of extra 40k chatter that popped into my head while trying to burn through some of a normal workload. We know an FAQ is coming out after the NOVA open in a few days. I am sure it will be just like the Adepticon one where something abusive is shown, the FAQ will probably be a bit late, and some people will cry that their armies are worse now. At the very least it isn’t a change that invalidates duplicated choices 4-6 in some people armies. Overall I don’t expect a ton of changes but hey – you never know. This article is all about me trying to guess what could happen. First of all – the beta rules from the BIG FAQ 1 will most likely be solidified with this upcoming FAQ. This means the Rule of 3 will be legit and solid piece of the game. It is the one I don’t expect to have changes done to it – beyond answering some things like – does a Captain from BA and a Captain from Marines count towards the same thing for a Rule of 3. The only one we have a real big question about is how you interpret Daemon Princes from the different evil factions. All of them are named differently but they are sorta the same thing. I know ATC ruled they count as the same but other events are fine with throwing out 9 mutated followers of Chaos. That army hasn’t been tearing up the play fields so I don’t think it is an issue but will see. The Tactical Reserves rule is something that has warped the game pretty heavily. It has invalidated some specific army builds (Blood Angels beyond Slam Captains) as well as brought some power to armies who don’t need bubble wrap nearly as often (Knights etc). I still think it is a pretty important rule change and something that helps some of the first turn army breaking we have seen – but wonder if there is a way to better balance it. I have heard chatter Cult Ambush changes and it makes me wonder if they are removing some of the other first turn charge options. I guess will see when Orks come out in Orktober and how the cult of the multi-armed god ends ups working out. I am about 75% sure this will stay, get a tiny rework, and be a part of the game we all know, love, and ruminate on. The Battle Brothers rule change is staying and might end up having other Keywords thrown in. I am wondering if will see a full removal of Soup style stuff especially if a rumored Ynarri book is coming out. I do get tired of seeing armies with a plethora of Chapters/Legions/Craftworlds used to try and “game” the system of Stratagems and vehicles. It isn’t nearly as far as most of the other Races don’t have such large pools to build armies from. Right now only two armies are truly abusing it – Eldar/Ynarri and Chaos + Legions. The last thing I am wondering about is how many Command Points some detachments are getting. I think the 12 given to a Brigade is a bit much – especially as one particular army can build one for very little in game points. This gives way too much of a bank of points that CP hungry armies would love to tear into. Mix that in with the ability to regain/rebuild the battery and you have something that most likely should have been caught before it was released. I know it is hard to really test and look at things as a whole – but having a resource that is extremely important be able to regrow in a way that is unchecked can be an issue. Of course I have played many a game with the Loyal 32 and have not gotten a single command point back. I think will see this part of the game relooked at and most likely tweaked a bit. It doesn’t help that the one army that loves a ton of Command Points (Imperium) has the best ways to use them. Chaos funnily enough really only needs some in the beginning with most games using a reroll or two and some simple stratagems. I don’t see much else really added beyond just simple tweaks. It feels like the game is overall decent with just a few stinkers here and there. I think the biggest issue in general is when you have armies overlap in ways that they are not really meant too. Each army is built with balances in check in how they work. Its when you have then have the ability to truly ally is when you get issues. Necrons don’t like anyone and they suffer for a lack of “choices”. I am hoping Orks don’t fall in that trap but I think they will end up being ok. They are already built to be “cheap” so having filled out detachments is something they can easily do. They also have one of the best “troop” choices in the game with the Ork Boy always being deadly. I do love the ability to create interesting armies out of combinations and other bits – but I do know that is how you find the loop holes and power combos. The things up for a nerf bat would seem to be the Command Point battery from the AM book. Either they will tweak how you roll for regrown command points (not per dice, maybe just one dice per Stratagem used), change the number needed to get the CP back, or just change it completely (roll a dice end of game turn to see if you get one back). Something will happen to it as half of the Nova Invitational has the AM Battery in there. Heck I would say almost every Imperial list has it – beyond things like Pure Knights or some other old school Marine build. It is just too powerful to not use when you can basically have an ability usable all game long (That’s So Raven Stratagem). I am also guessing will see some more – Once Per Game Stratagems – come about. The already mention That’s So Raven could see a once a game option as well as the dreaded Agents of Vect. I am sure there are some others that might just get lumped into a single option – like the Taranis Knight one allowing you to stand back up again. I also wonder if some things will get reworked like the Ad Mech infiltrate option that gets an added rule of only allowing Infantry – just like every other similar power. I bet the Space Wolves Chooser of the Slain gets an FAQ update that says it can only be used on friendly Space Wolves instead of a blanket everyone gets a chance to shoot that it is now. I am also wondering if will see more “GW” related GT style musing as well – since we read that stuff is coming next year. I got a chance to look at the Citadel before it opened and the idea of bring back some Warhammer 40k GT has me excited. I remember going to the last Las Vegas one years ago and cherish those memories of trying to be the best. It would be amazing to have them again especially if they are up in North Texas. We’ll see as the months move along and we get a more solidified 8th edition with everyone’s army having a real codex, stratagems, relics, and warlord traits. ~What do you think we’ll see in the 40K BIG FAQ 2?